As time goes by, so changes our needs. 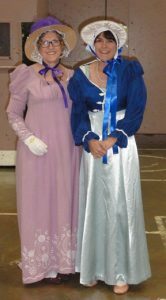 I needed a new gown for the Jane Austen Festival at Port Alberni, BC, Canada in July 2017. The reason: an extra 2” in size due to a medication change about a year ago. 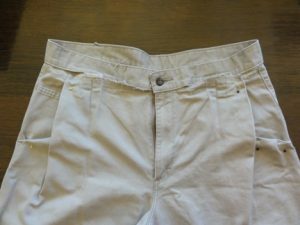 In addition, Mr. Suze’s trousers had suffered an impossible-to-mend knee blowout at the Louisville JASNA AGM and, rather than have him wear basted Dockers, I planned to make him new ones. Add to the mix that my sister Lynn from Calgary, Alberta decided to join us, and I had offered to make her a bonnet, and I was one busy seamstress this summer. Yes, I sewed. I had a 4m length of violet Swiss dotted cotton with embroidery down one side that was perfect for mourning Jane Austen 200 years after her death. It had cost me $7.99 at Value Village. First, I made what’s called a muslin: a gown from a $7.99 bedsheet to test my pattern. 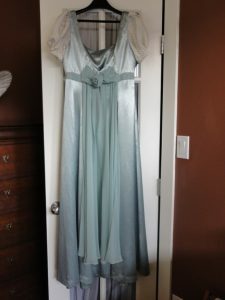 I made the bodice pattern myself from modifying a blouse pattern I got for 99₵ at Value Village, and the skirt was a straightforward set of rectangles and truncated triangles per numerous online Regency gown patterns. The muslin is for sale, but too small in the bust for me. I also made removable long sleeves so the gown would do for a day dress and ball gown. 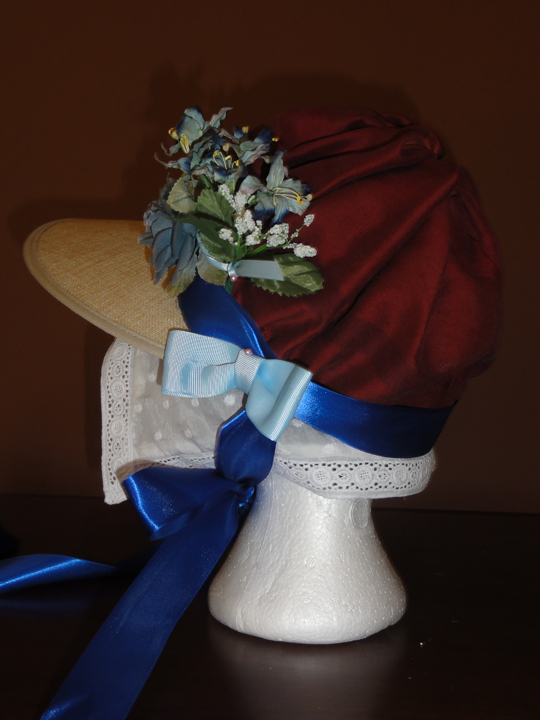 My cottage bonnet was made from $3 picture brim straw hat with just the right shape. I got it in Walmart in Mexico and trimmed it up with flower hair accessories from Ardene and a huge purple feather from Dressew. I wore my new $65 off-white bustier, some Ardene clip-on roses trimmed some purple ballet flats, and my accessories were in my collection already. I had a wardrobe problem, though: I had forgotten my slip at home, which comprises a scoop-neck, cap-sleeved blouse and empire-waisted petticoats with lace trim at the bottom. Because I was reading from a work-in-progress at the afternoon readings and play, I would be in bright stage lights with a lightweight gown with a sheer bustier underneath! Thankfully, the three of us rushed to Walmart where I purchased a white camisole for $3 and some simple white capris (pantalettes) for $14.99. For Mr. Suze, I modified a pair of pleated Dockers that were too big for him that were in his closet in order to provide some pretty snazzy breeches. Here you can see some of the steps I took to make the pleats look like falls. I made a wide waistband from the part I cut off. He has 5 buttons on each leg, and added to those on top, I self-covered and sewed on 16 buttons for those breeches! The rest of his costume was outlined in former TSRCE posts, and cost about $180 in total. Lynn was lucky: with almost no effort, she found a gown on Craigslist. 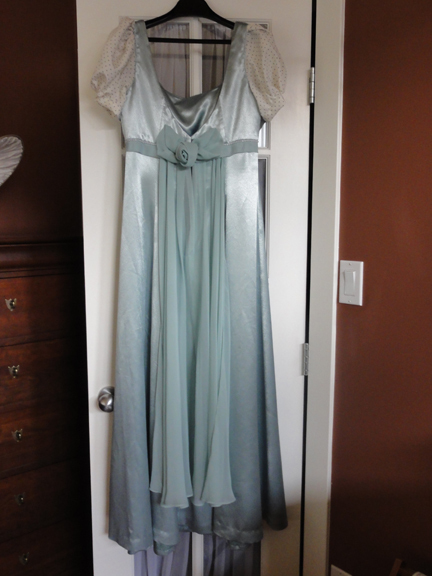 For $20 she got a sleeveless, pale green, empire waisted gown with a sheer sash. I was able to make her short puffed sleeves using some off-white satin fabric with dots one shade darker than her gown. She also found a perfect little red parasol in the coat room where she worked. It was broken but Mr. Suze repaired it so it would properly open and close. I modified a spencer I already had for her and loaned her pink ballet flats, reticule, fan, and hair accessories. She has long hair so we had fun with the up-do for the ball. I made a nice capote bonnet for her using silk from a throw cushion cover, a $2.99 visor from Value Village, and ribbons and flowers I had on hand from various sources. I hand-sewed it, shirring a lining for the inside brim, and I’m very proud of the end product. Lynn and I also wore new lace caps under our bonnets. Alas, although we broke the record from the previous year, we didn’t surpass the official Guinness record of 409 set in 2009 in Bath, England. However, it was fantastic to see so many people in Regency costume all at once! 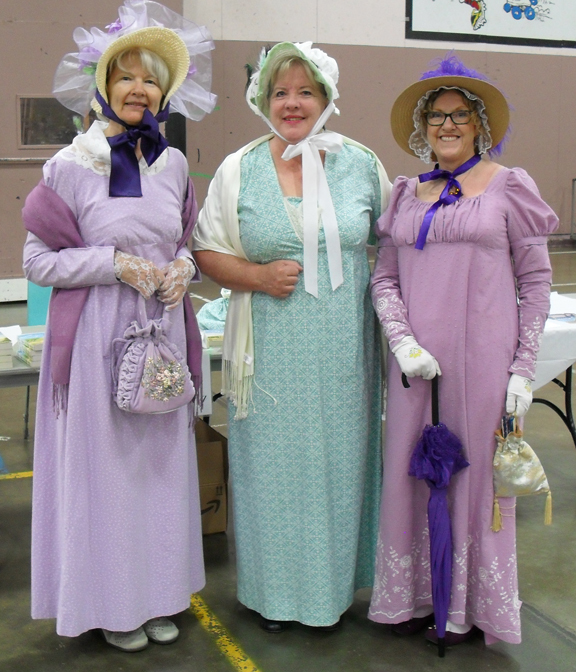 I met JAFF and Chick Lit author Shannon Winslow who was at the book signings at all three main events on Saturday with Regency romance author Helena Korin and me. I bought a signed copy of Shannon’s latest, Leap of Hope, and got it signed! Unfortunately, we forgot to take pictures at the Masqerade Ball that evening. Lynn and I had Venetian masks to match our costumes and Mr. Suze had a little “Zorro” mask that fit under his glasses. So readers know how I looked that evening, I got dressed up in my ballroom costume this week. My feature purchase was discounted, yet it still cost more than everything else in my costume combined: my $199 armpit length, off-white, kid opera gloves. I also have a new fan from Mazatlán at $3. I’m not wearing the bustier in this pose, but instead, a balconette bra to show you how it looks (see the post on Regency unmentionables). You can also see my Joe Fresh jewellery bought on sale for $6 for the earrings and $8 for the necklace. On the dresser is Lynn’s bonnet remade with the purple trim from my Port Alberni hat. My $20 Venetian mask has a stick so I could hold it up in front of my glasses. Lynn’s mask was similar, but it had ribbon ties and different embellishments and cost $15. 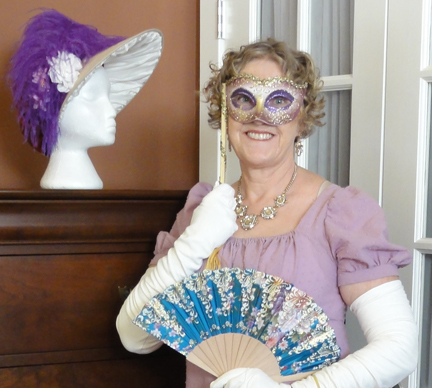 We had a great time in Port Alberni once again, and our masks are nice souvenirs of the 2017 Jane Austen Festival/sister bonding event! 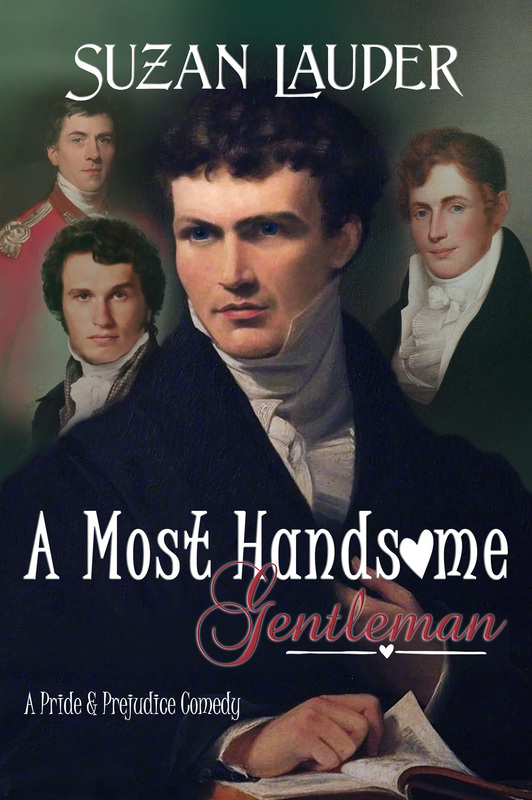 Wondering about A Most Handsome Gentleman, or #HOTCollins? Watch for blog posts on Meryton Press over the next couple of weeks prior to its release on Amazon! This entry was posted in The Thrift Shop Regency Costume Experiment and tagged Author Helena Korin, Author Shannon Winslow, Costuming, Craigslist, Dockers, Dressew, Guinness Book of Records, Joe Fresh, Port Alberni Jane Austen Festival, Regency, Repurposed and upcycled fashion, Suzan Lauder, The Thrift Shop Regency Costume Experiment, Value Village, Walmart by Suzan Lauder. Bookmark the permalink. To Tricia: I appreciate kudos from a professional costumer like you. Thanks so much. 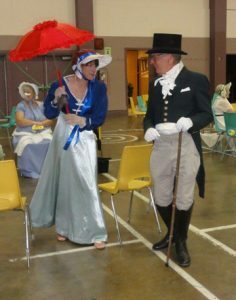 I’ve never been involved in a Jane Austen Murder Mystery, but it sounds like fun! Anything you organize is enjoyable, though. It’s on our calendars! I will have to make a couple of new gowns now! To Shannon: Thanks! Mr. Suze loved talking airplanes with Mr. Shannon, and they both looked terribly handsome in their Regency costumes. I hope to see you again next year, or perhaps at an event in your neighbourhood. Really great article Suzan. I loved your rendition of britches from a pleated pair of pants. Never considered using those pleats to make the Fall. Well done. You looked wonderful throughout the entire Festival and it was such an honour to have you, Shannon and Helena to bring your talents and works to the Festival again this year. We have just set the date for next year…..July 6th, 7th and 8th. Mark your calendars as it promises to be better than ever. Just a hint…..I hope you enjoy Austen Murder Mysteries? I enjoyed this, Suzan. That was a lot of work you went through, but not a lot of money! You’ve inspired me to update my Regency wardrobe before whatever turns out to be my next dress-up opportunity. It was so lovely to get to know you at Port Alberni, and I’m glad Mr. Suze was there to keep Mr. Shannon company!